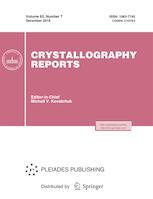 Crystallography Reports is a journal that publishes original articles short communications, and reviews on various aspects of crystallography: diffraction and scattering of X-rays, electrons, and neutrons, determination of crystal structure of inorganic and organic substances, including proteins and other biological substances; UV-VIS and IR spectroscopy; growth, imperfect structure and physical properties of crystals; thin films, liquid crystals, nanomaterials, partially disordered systems, and the methods of studies. Crystallography Reports is a peer reviewed journal. We use a single blind peer review format. Our team of reviewers includes over 20 reviewers, both internal and external (95%). The average period from submission to first decision in 2017 was 20 days, and that from first decision to acceptance was 30 days. The rejection rate for submitted manuscripts in 2017 was 20%. The final decision on the acceptance of an article for publication is made by the Editorial Board.